In his review of Me and You and Everyone We Know (Miranda July, 2005), Asad Haider critiques the Slovenian scholar Slavoj Zizek’s analysis of modernism and postmodernism when he writes, “Imagine if, in Samuel Beckett’s play, Godot actually did come – and he was just a regular guy. This… encapsulates the difference between modernism and postmodernism… the key figure in modernism is the absent centre, the emptiness that enables any social structure but which, at the same time, cannot be found within it.” The tramps in Beckett’s seminal play wait absurdly for Godot, who never arrives. The play’s beauty is derived from the lack of an encounter with the narrative’s driving force, Godot, and that lack of an encounter defines Beckett’s modernist play. Conversely, postmodernism is “a matter of overwhelming presence; that is, an obscene, dull intimacy with the object(s) that defines the system” (1). Postmodernist theory emerges from the repeated, almost crude, encounters we have with objects that carry value and meaning. Commercial, technological, cultural, or other forces fuel those encounters, and they force us to redefine the meaning and value of those objects. This analysis is also applicable to Werner Herzog’s provocative 2005 documentary Grizzly Man: the bears are similar to Beckett’s Godot, but in Herzog’s documentary, they arrive with a profane intimacy. For years, grizzlies have represented that modernist absence: they have been anthropomorphosised, from a distance, in cartoons, films, and as sports team logos, and they have unwittingly helped define the rituals and customs of many cultures. Many indigenous people have lived next to them, but never “with” them. Timothy Treadwell, Herzog’s protagonist in Grizzly Man, shattered that absence by living with grizzlies and placing documentary-style footage of his experiences with them in our living rooms. He destroyed the boundaries separating grizzly and human and develops an intimacy with them that ultimately turns tragic. Treadwell neuters their mysterious, powerful personalities and packages them into another Animal Planet experience, while Herzog reminds us of Treadwell’s inability to fully, intimately connect with them. Treadwell pays the ultimate price for his experiment: both he and his girlfriend are eaten alive by the creatures he sought to deify. Thus, Grizzly Man is a postmodern exploration of the contrasts and paradoxes that haunt and enlighten our lives. Who was Timothy Treadwell? Herzog’s interviews with Treadwell’s girlfriends, parents, and friends paint a normal picture. He was born in Long Island, New York in 1957 and had an average family life; in his formative years, he developed a kinship with his mother based on their mutual love of animals. Treadwell floundered in and out of college for years, and his penchant for the camera was demonstrated when he moved to Hollywood and appeared as a contestant on Love Connection. According to his father, Treadwell was second choice to play the character of Woody on Cheers. He later stumbled into broken relationships and heavy drinking and cultivated an interest in grizzlies. For more than 12 years, he videotaped grizzlies and his interactions with them near Alaska’s Katmai National Park. He traveled to many elementary and high schools sharing his experiences and knowledge about grizzlies, became an advocate for grizzly conservation and started the non-profit organisation Grizzly People. His national celebrity was evidenced by his 2001 appearance on The Late Show with David Letterman. Grizzly Man hinges on contradictions, and the most intriguing is its subject-object paradox. Herzog articulates the murky distinctions and complex tensions between subject and object: If grizzlies are the objects of Treadwell’s obsession, he is the subject who, while admiring them, erases the boundaries between grizzly and man. By living with grizzlies, Treadwell became the subject of his own videotaped footage. In his eyes, grizzlies and humans were inseparable. 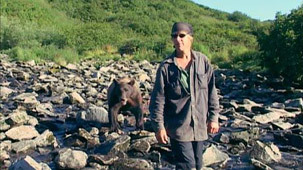 Throughout Herzog’s documentary, Treadwell’s friends note how he was becoming, through his behaviour and lifestyle in the wilderness, like a grizzly. But tragically, Treadwell never adequately realised that this imbalanced subject-object relationship could never work in reverse: the grizzlies could never become like him. And Herzog is careful not to become the object of his own documentary. While Treadwell shattered the wall that divides subject from object, Herzog rebuilds it. Towards the film’s conclusion Herzog confesses that in Treadwell’s grizzlies he sees nothing more than cold, impersonal indifference. For Herzog, grizzlies are wild killing machines, and in his opinion, “it is chaos which is the common denominator” and not harmony. (In early September 2006, this point was further emphasised by the tragic death of Steve Irwin, the “Crocodile Hunter”, who was killed by a stingray’s lethal barb while filming a TV nature program.) Herzog refuses to fall prey to the pop culture-induced sentimentality, or Disneyfication, of animals rampant in culture today, and he refuses to succumb to Treadwell’s ultimate transgression: his inability to distinguish between subject and object. Grizzly Man’s cinematography, which is mostly derived from Treadwell’s footage, illustrates another contradiction: the beauty of the scenery and cinematography clashes with the narrative’s tragedy. The panoramic mountain ranges, rolling tundra meadows, and meandering streams of Alaska’s wilderness frame the exquisite beauty of Treadwell and Herzog’s haunting narrative. Most people approaching this film know something sad and ugly lurks in the story’s conclusion, but the scenery helps viewers forget that tragedy. What we see reveals beauty; what we are told unleashes horror. Treadwell’s friends aptly observe that he thrived on chaos. His life was a complex of risks and a quest to transcend the boundaries that define normal modern living. However, although Treadwell breathed chaos, his most lasting contribution is the non-profit organisation he formed: Grizzly People, whose name neatly conveys the metamorphosis Treadwell felt he experienced. The group honours and continues to pursue Treadwell’s passions, and its mission is to preserve “bears and their wilderness habitat. Our goal is to elevate the grizzly to the kindred state of the whale and dolphin through supportive education in the hopes that humans will learn to live in peace with the bear, wilderness and fellow humans.” (2) According to the organisation’s website, “Leonardo DiCaprio’s production company, Appian Way, has teamed up with Sony-Columbia Pictures to develop a film on Timothy Treadwell”. Clearly, Treadwell’s legacy will endure. But that legacy has been challenged. Herzog’s documentary makes one wonder if Treadwell brought more attention to himself than the grizzlies. As Herzog notes, “Facing the lens of the camera took on the quality of a confessional”. And it is this quality that gives the documentary its religious overtones: Treadwell wants redemption and to connect with something larger, more sublime than his own existence. Grizzlies became the bridge Treadwell had to cross because he had much to confess. The extended footage of Treadwell’s monologues about his sexuality and drinking; his many highs and lows; the lack of footage of his girlfriend Amy Huguenard; the ecstasy he feels about a particular grizzly’s excrement, which compels him to exclaim, “I can feel the poop”; and his incessant, angry rants aimed at the National Park Service, force one to question his mental health. He is portrayed, at times, as a confused zealot who will resort to violence to protect his cherished objects. The documentary’s second half paints Treadwell in a disturbing light and sadly may undermine his noble mission. One telling example of Treadwell’s almost pathological loneliness is the kinship he cultivates with foxes. Some scenes suggest he is more interested in them than grizzlies, perhaps because foxes are more social animals than the typically solitary grizzlies. Did Treadwell help or hurt the grizzlies? Only time can answer that question. But according to one local expert, Treadwell showed disrespect to them because he trespassed their sacred grounds, ultimately showing the arrogance of man: Who are we to believe we can coexist with such magnificent animals? Herzog interviewed ecologist Marc Gaede and his wife, who read letters from anti-environmentalists who despised Treadwell’s efforts and reduced them to the rantings of a left-wing lunatic. Another argument against Treadwell is that he made bears more accustomed to humans, which subsequently makes them more dangerous for humans. Other people interviewed in the documentary essentially believe Treadwell got what he asked for. While that assessment too harshly politicises the tragedy of this event, it does provide an alternative view that should be considered. Through his death, Treadwell may have breathed the most potent molecules of life into his mission to preserve grizzlies and their habitat. Grizzly Man’s tagline reads: “In Nature, there are boundaries. One man spent the last 13 years of his life crossing them.” Were his crossings in vain? Did he go too far? That’s for you, Time, and perhaps the grizzlies to decide. Asad Haider, “Me and You and Everyone We Know: The Postmodern Happiness of the Contemporary Art Film”, Senses of Cinema no. 39, April-June 2006. Chris Justice is the Director of Expository Writing at The University of Baltimore.